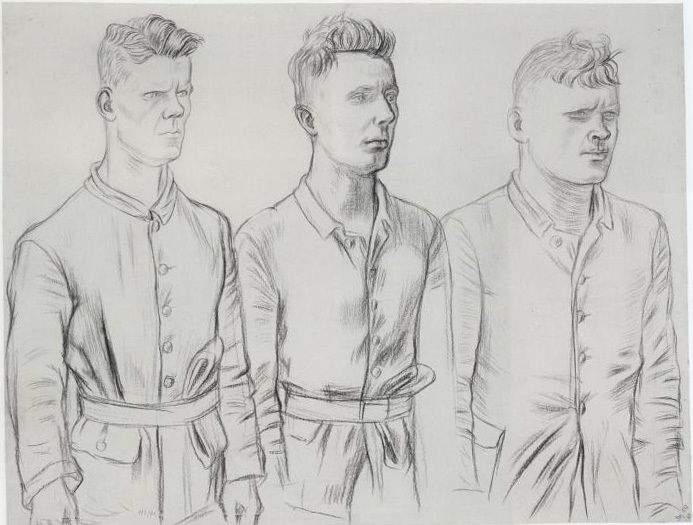 Three recruits – three facial expressions, three bodily postures and one common alertness mixed with deep seated fear of what war can do to them. These German recruits were under the Damocles’ sword of mandatory military service, but American recruits today who are free to make their own decision about enlisting or not, are in actuality not free from the necessities which can force them to sign up – chronic unemployment, inflated price of college education, general pauperization as a result of austerity measures and modest but a reliable salary for being military. The face of the recruit on the left shows that he is already psychologically mobilized, and his stern seriousness includes militancy. His eyes and gaze communicate that he’ll be able to meet the enemy without any sentiments. His neck and head are one with his body which is already took a form corresponding to commands of his superiors. In comparison with his buddies we, the viewers of the drawing can see his hands, and that, probably, suggests his readiness for the weapons which he’ll get soon. The recruit in the middle seems to be much more human. His forehead is more streamlined, the facial features are soft. His lips has a slight grimace of a sulking on his destiny. Still, his eyes are accepting what is happening to him – he is ready to make an effort. The recruit to the right is stocky and rather thickset. But the most interesting in him is that he reacts on being “in the line of duty” with the strongest concentration. His attention to what is before him is the sharpest – as if, he is already taking aim to open fire. How much in his ability to be attentive to what’s going on in front of him is real and how much is a pose in front of his sergeant is difficult to say. The practice of subjugating the already educationally limited human beings by making them recruits and soldiers through despotic rule and ideology of jingoism and megalomaniacal promise to triumph over enemies is congruent to our human nature. To corrupt ordinary human beings into becoming killers of human otherness in the world is the warmongers “noble” “high craft”. It’s so much more difficult to learn how to talk and negotiate peacefully with different from us (dissimilar) people than to understand scientific miracles. That’s why when Einstein in his later years comprehended it he became the object of suspicion and hate even in a democratic country.